Where to begin with our Ikea kitchen? Well where I began was simply Googling “Ikea kitchen blog”. I find that people who blog are a lot more realistic so a blog about an Ikea kitchen will truly let us know how to get it done. Where that led me was Little House Blog. They gave me tons of helpful hints! I decided to start with a piece of graph paper and a pencil. Ikea does have software (which I did use at the end) but I found it clunky and difficult to play with. I started by drawing out our kitchen on a piece of graph paper. I did draw it to scale so I could get the feel of it. 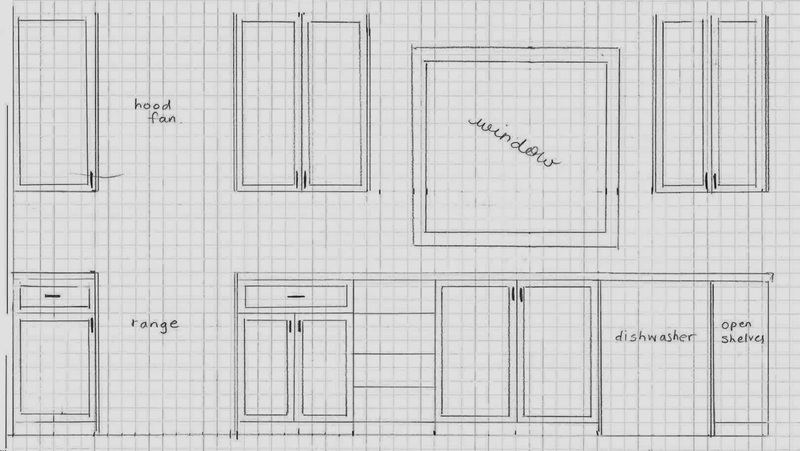 From there I looked at the size of cabinets and stacks of drawers that Ikea offers and cut them to scale out of more graph paper, then began placing them on to my kitchen floor plan. Because I could physically move the pieces around I was able to see what I liked and what I didn’t. I had already selected our appliances so I cut those out as well and played around. The trickiest part was the range wall. I had two constraints, the placement of the window and the placement of the range. We didn’t want to move the range because that meant moving venting which is costly and let’s be serious moving a window is definitely not practical in our budget. One of the hints I got from Little House Blog was to view the cabinets like puzzle pieces. Don’t be limited by what the “typical” use of the cabinet is. This is how we arrive at our appliance garage. I like things to be put away nicely (I make my husband put away the toaster in a cupboard every morning). I’ve heard that appliance garages are passé however; tidiness will never be passé so I say appliance garages are the best! 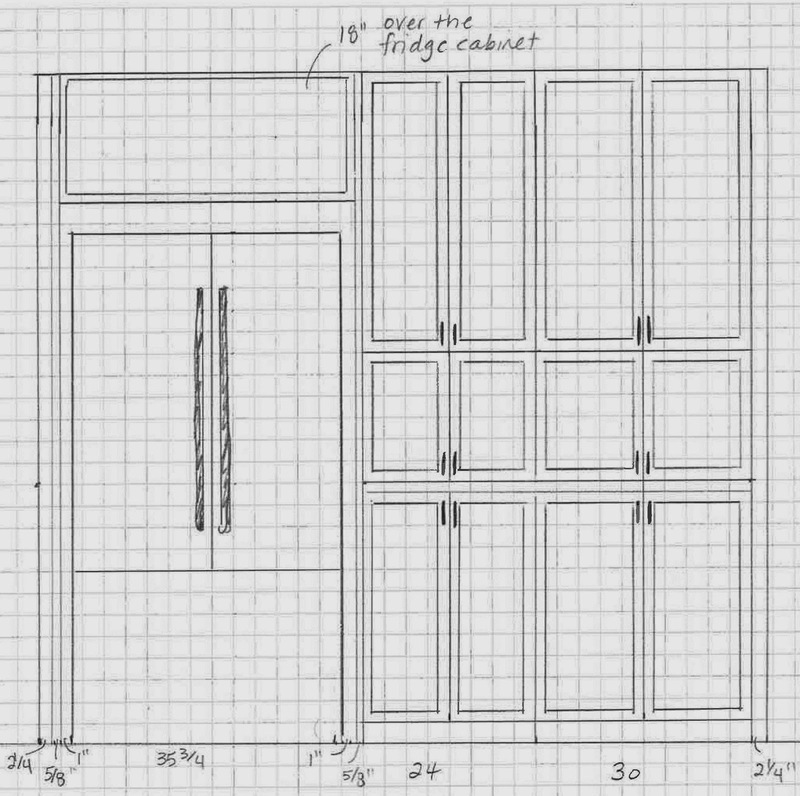 We used an 18” high (the typical measurement from the top of your countertop to the bottom of your upper cabinets) fan cabinet for our appliance garage. It might be tricky to install but we’ll address that when we get to it. After we designed the fridge wall, we decided to make our own ‘over the fridge shelves’ for our cookbooks. Built in microwave, this was something that was very important to me. Before, the microwave sat on a ledge near the fridge. I felt that takes up a lot of space that could be used for cabinet storage. My solution was to build it into the island. Once I was happy with my sketches I knew it was time to brave the Ikea software. After I got the design somewhat complete on the software I took it into the store. When I say somewhat complete I mean all the elements were there but nothing was 100% lined up. I didn’t care so much because I had my sketches which gave me the precise measurements and spacing. The Ikea guy sat with me and went through everything and saved me a TON of materials that I had unnecessarily added. We set up our delivery date, he pointed out that everything I needed was in stock at the depot except one cabinet box which they happened to have at the store so I could pick that up that day (which I did). At the point when that is the situation, there are various devices, likely an expansive number of devices, which you will require. Whilst there is a decent risk that you may as of now have most of the devices required for your next kitchen redesigning venture, there is additionally a chance that you may not. However, you can discover more about Inova Stones from our blog. At Classic Quartz Stone we develop a motivated effort to offer wholesale the very best good quality engineered quartz slabs to be used in residences and commercially. All our slab products are composed of using 93% pure quartz with the remainder being reused glass, recycled stone, aggregates and also glass beads. You can find us on http://classicquartzstone.com. Ikea is a good brand for using them ideas in our kitchens.